If there is one veggie you want to grow a lot of in your backyard garden, it’s onions! Onions are used in just about every meal–soup, stew, baked chicken, lasagna, even pizza. Without onions, food tends to be fairly bland and tasteless. You need onions for cooking, so it’s definitely in your best interest to plant a lot of these aromatic veggies in your garden. Fancy yourself a gardening pro? Planting onions from seeds is a pretty epic challenge, but it can yield onions that mature more quickly. To plant onions from seeds, you’ll want to get the seeds in the ground roughly 30 days ahead of your frost-free date. Continue to sow the seeds every few weeks. 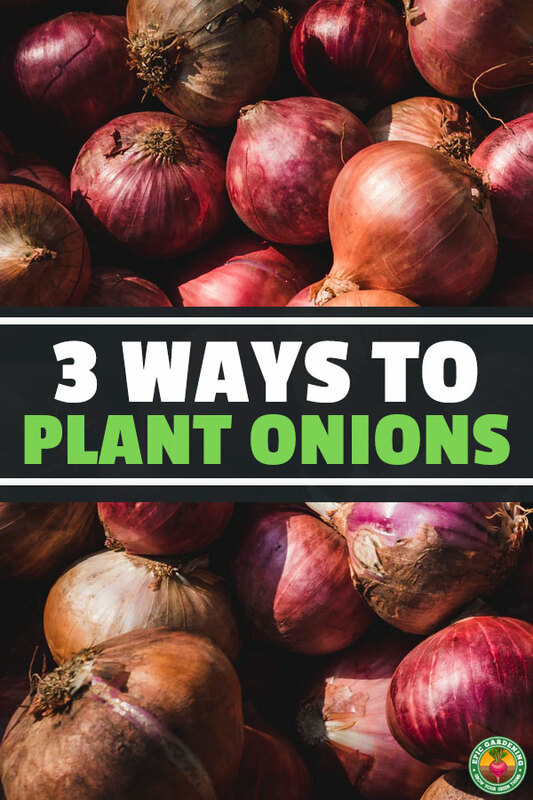 You can sow them all the way through the fall–in some parts of the south, the prime time for growing onions from seeds is fall through spring. Make sure that the seeds you use are no more than one year old. Onion seeds lose their viability quickly if they are stored, so seeds that are older than 1 year are far less likely to grow. If you really want to increase your chances of growing onions, use fresh seeds for optimum results! If you already have onions growing in your backyard, you don’t really need to plant new seeds. You can transplant onions from existing plants, or you can buy bareroot onion bundles for transplant. For those in the northern US: You will want to plant the seeds at least 8 weeks before the final frost of winter. This will ensure that, when it comes time to transplant the shoots 6 weeks later, the ground is not too cold and the risk of frost is much lower. For those in the southern US: Set out the seedlings in either the fall or winter. Plant the seeds in a seed-starting container or flat. Once they begin to grow, thin out the seedlings until they are roughly ½” apart, and the rows are roughly 2″ apart. This will make them easier to separate come transplanting time, and will ensure that the surviving seedlings grow healthy and strong. A few weeks before they are going to be transplanted, it’s time to toughen the seedlings. Place the tray outdoors, in the shelter (protected from sun and wind), leaving them there for a few hours every day. Leave them there for longer and longer until they are accustomed to a full day of sunlight. Transplant day: Lift them carefully, shake off the soil, trim back any wispy parts of the plant until the seedling is about 6 inches long, dig a trench for the seedling, and plant. Ultimately, you want the onions to be planted about 4 to 6 inches apart, but for now, plant them a bit closer together. This will allow you to harvest green onions (while still young). For beginners who want the easy route, sets are the perfect option. They are small onion bulbs that have been forced into dormancy while still immature. They will continue to grow as soon as you plant them in your garden, yielding a crop of onions in no time. Your plant date should be between 14 and 30 days before the last-frost date. If you live in a part of the country (or world) where winter is mild, you can plant onion sets throughout both the fall and winter. The sets need to be planted in shallow furrows and covered with only a small amount of soil–just enough so you can still see the pointed tips. Plant them about 4 to 6 inches apart, or closer if you want to harvest some as young green onions. The only downside to using onion sets is that your varieties are limited. Note: When shopping for onion sets, DO NOT buy the largest ones in the bin. These may end up going to seed instead of producing large bulbs. Instead, look for the sets that are roughly ½” in diameter. These are the ones that will produce the best quality onions! When the days start to grow long, the onions start to grow! That’s a rule of thumb you can use to know when to plant and grow your onions. The onions that grow in the south are different than those grown in the north. This is because there are more daylight hours in the north. When shopping for onion seeds, find the right seeds according to your region. There are only a few varieties of onions that can be grown anywhere; the rest need to be planted in the right region in order to grow properly.